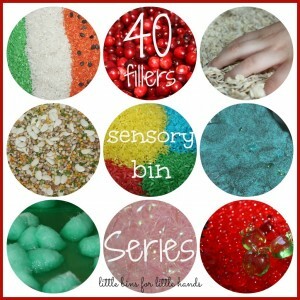 Super excited to be taking part in 40 Sensory Bin Fillers Hosted by Little Bins for Little Hands. 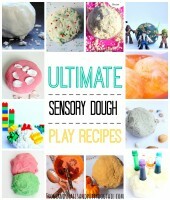 What a great resource for sensory bin play from so many wonderful bloggers. They are all in one place here on the home page . 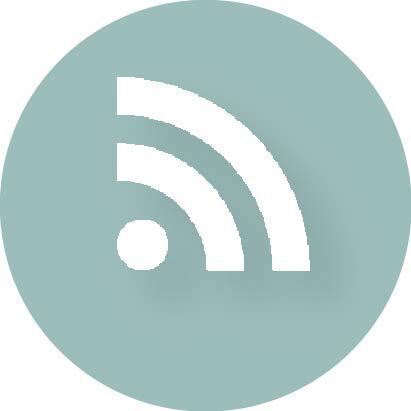 A must click on link to see them all! 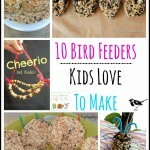 If you follow my blog or site here on Frogs and Snails and Puppy Dog Tails then you know we LOVE bird seed. 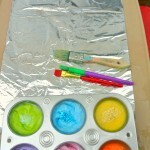 We love to play in ti, we love to paint with it, we love to make bird feeders with it. We just can never get enough of it. 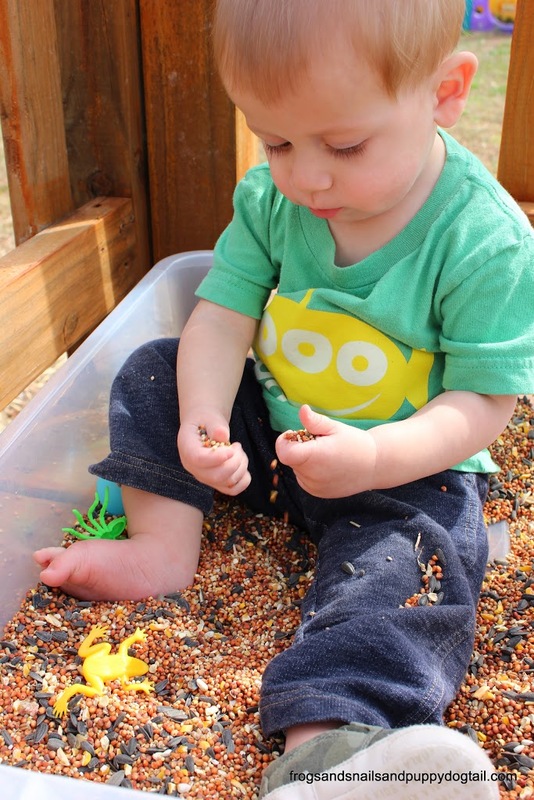 All 3 of my kids ages 1yr, 3yr, and 5yr all love playing in bird seed. There is just something so magical about it to them. I will also admit I find myself running my hands through it while they play. 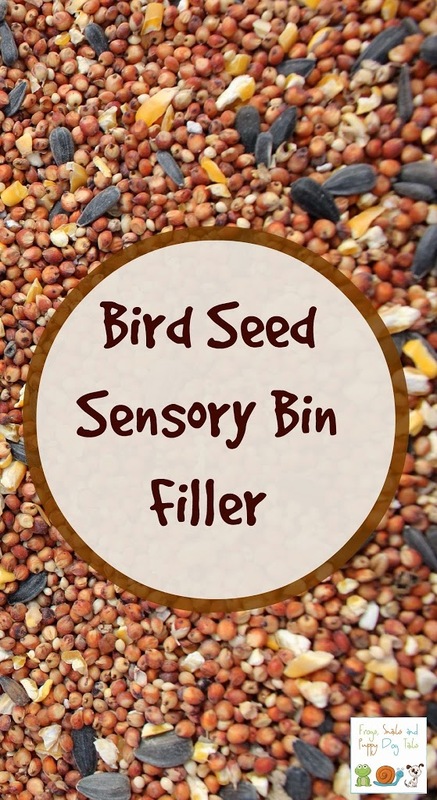 So when I had to pick a sensory bin filler to share with you all I knew BIRD SEED would have to be it! 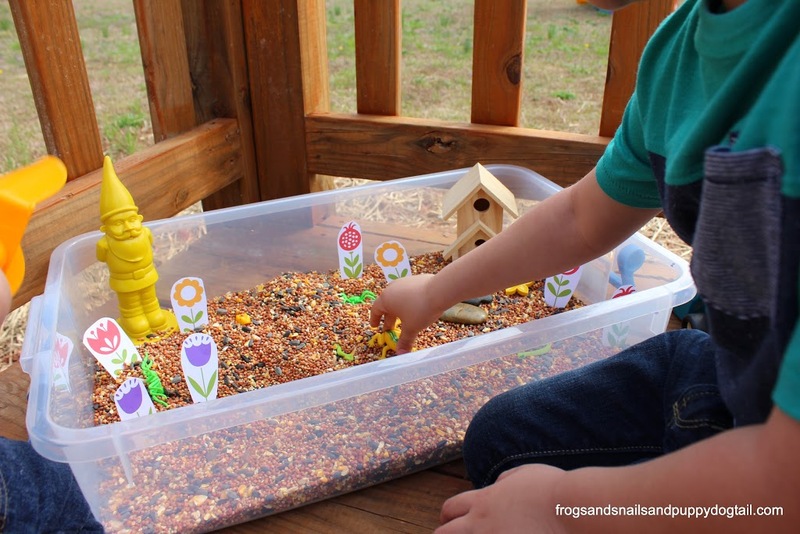 This time we set out to create My Garden ~ Bird Seed Sensory Bin. I just love how it turned out and the kids have been having ongoing fun with this bin. First things first. 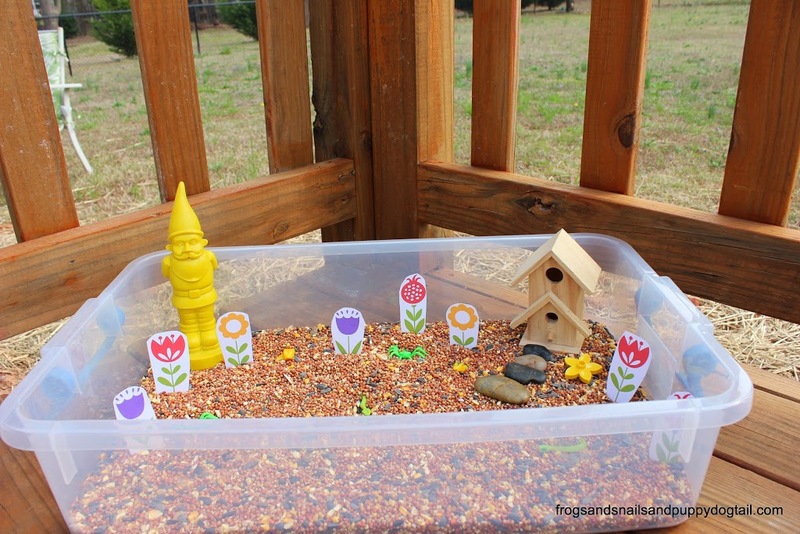 Pour bird seed into the bin. 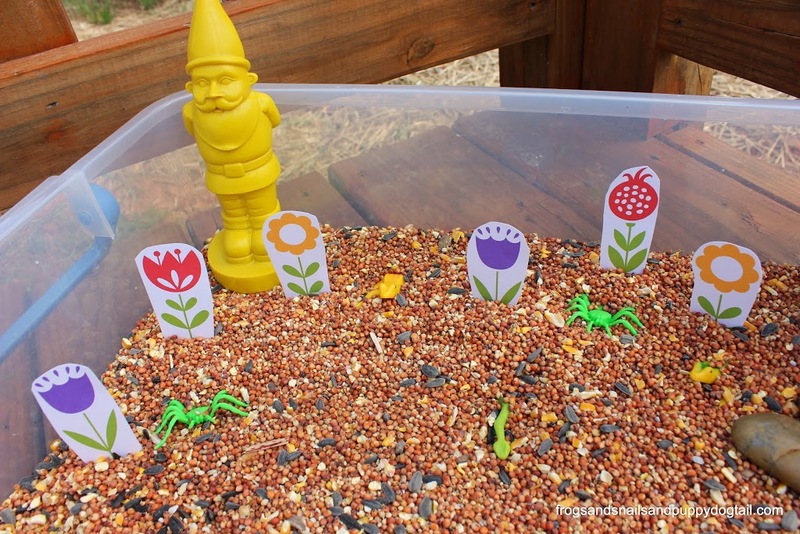 Now take the insects and reptiles and bury them a little. 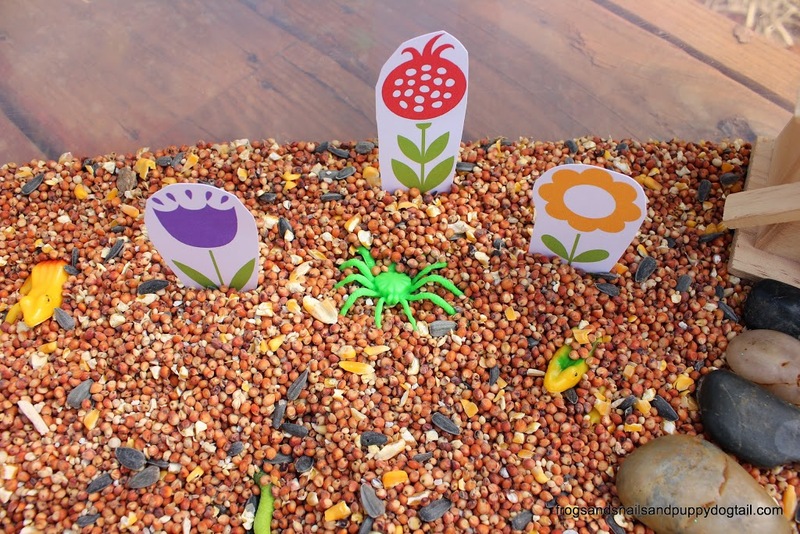 The kids loved searching for them in the bird seed, and finding them one by one. We called out what each one was as they found them. 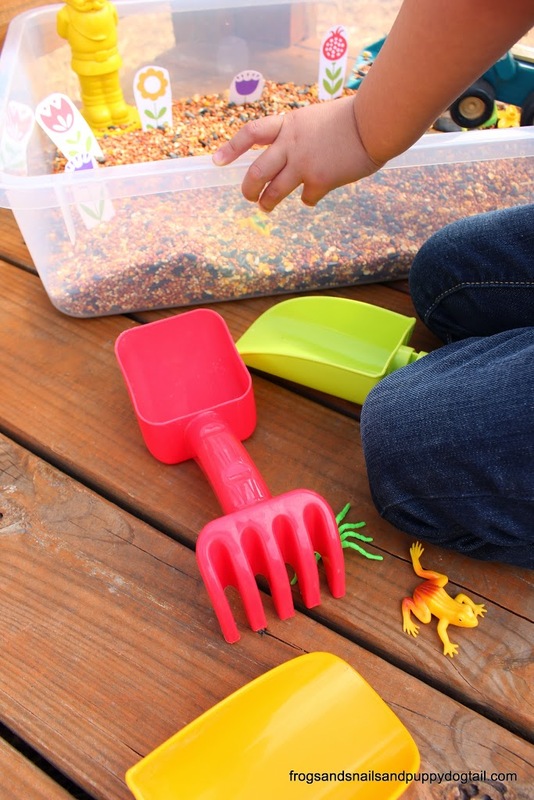 You can add a little learning in almost any play activity with your kids. Now to place in the garden gnome and bird house. I put these on opposite corners to balance out the look of the bin and leave the middle open for playing. I then added the stones and plastic flower to the bin. The last item was the printable flowers I made for them. It would not be a very good garden without flowers. I left the scoops and trucks out of the bin so it was not too cluttered. 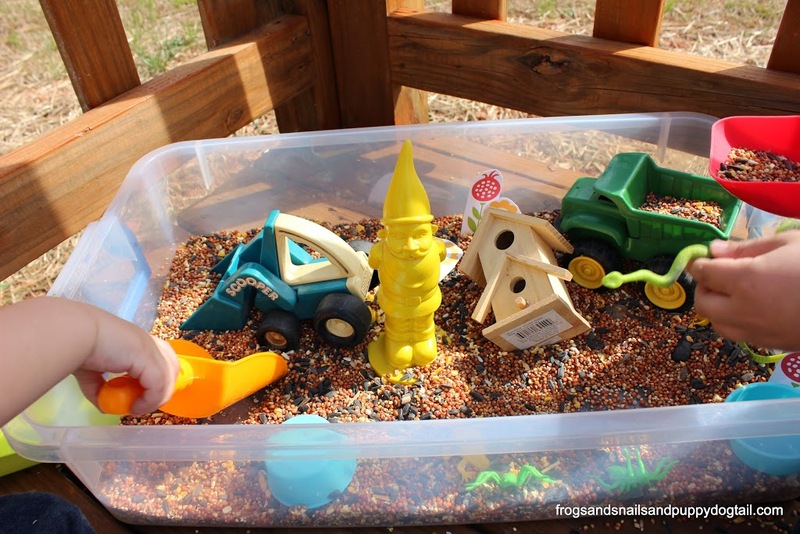 I love simple when it comes to sensory bins most often. 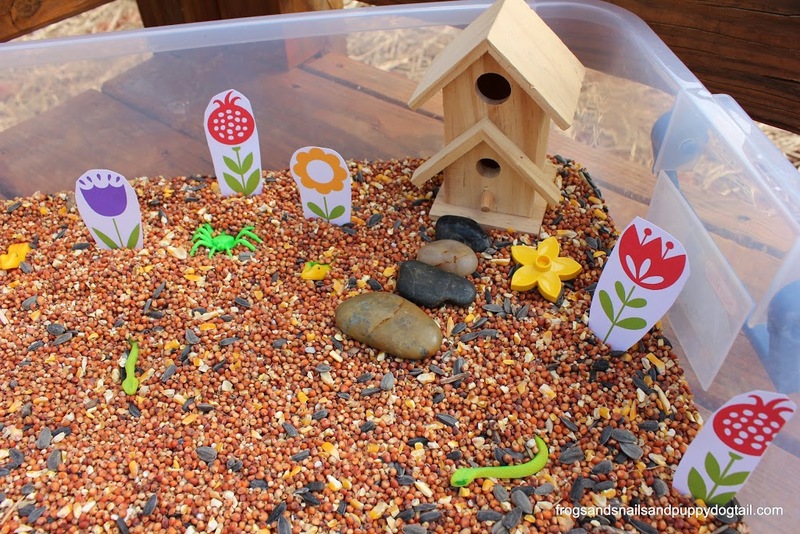 This also gave the kids time to explore what was in the bird seed bin before adding the other items. They could not wait to start playing. Hands on fun for the kids and great way to explore sight and touch. 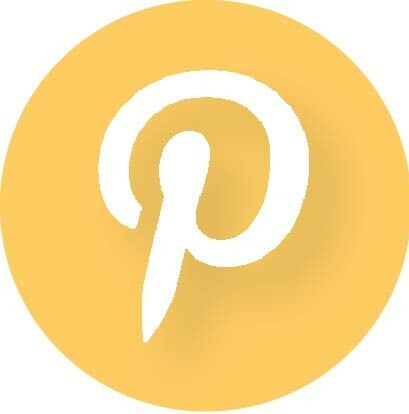 This is a open ended activity. The kids come in and take over. 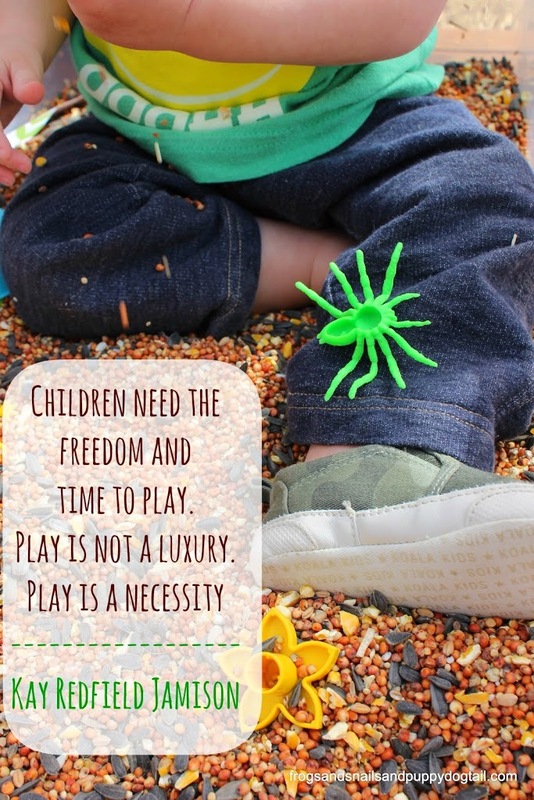 Learning through play works for us. 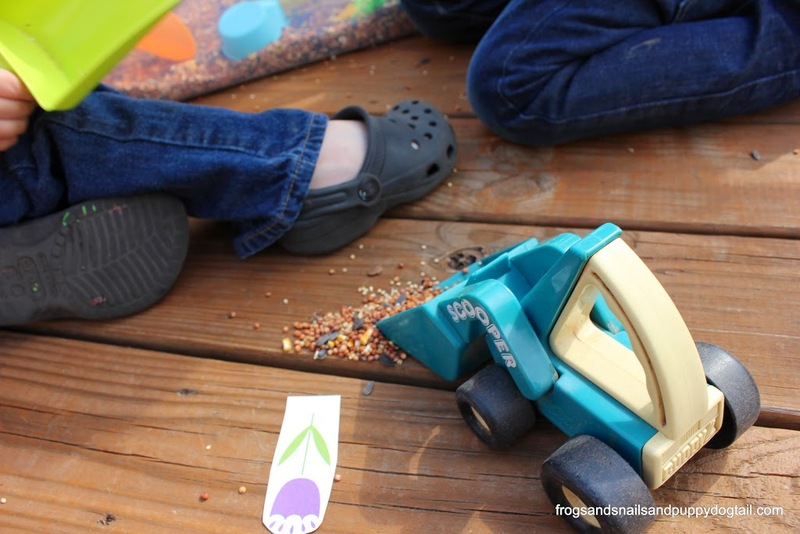 As you can see above the kids had the trucks and scoops out after the initial investigation of the sensory bin. Scooping is great for gross motors skills. 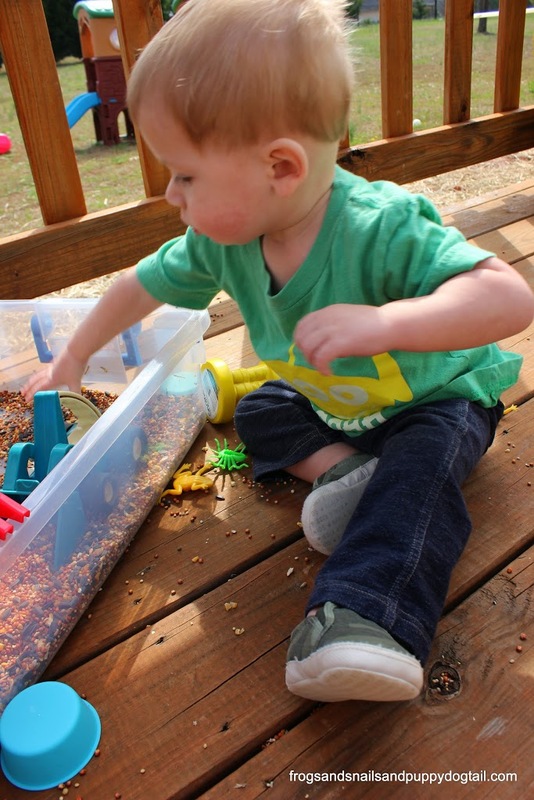 Once they went to watch dad cut the grass, baby brother slid over to get an up close view of the sensory bin. 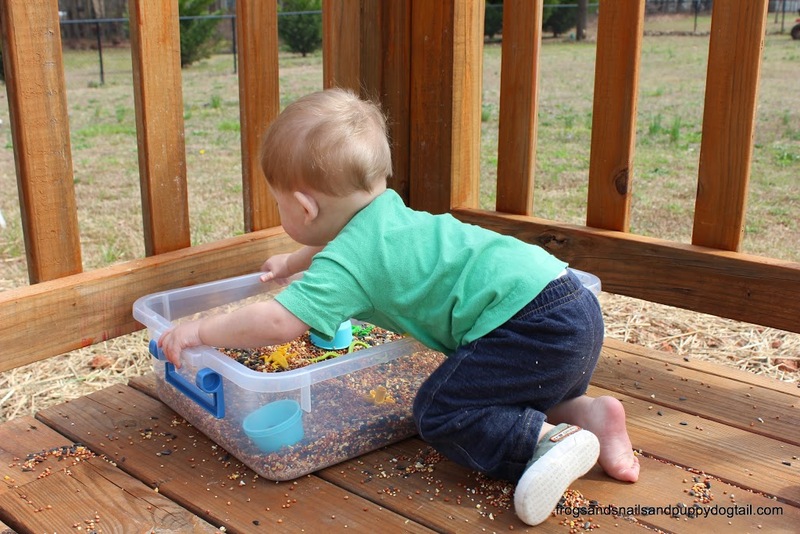 This was not his first time playing with bird seed but it was his first time playing in this bin. 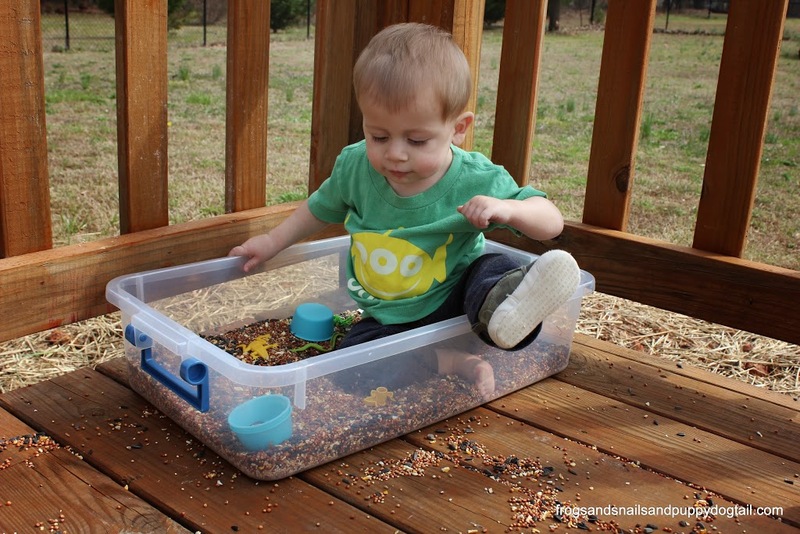 He played in bird seed in the water table before but that was not the same. I truly enjoyed every moment I sat there beside him and watched as he took this new experience in. 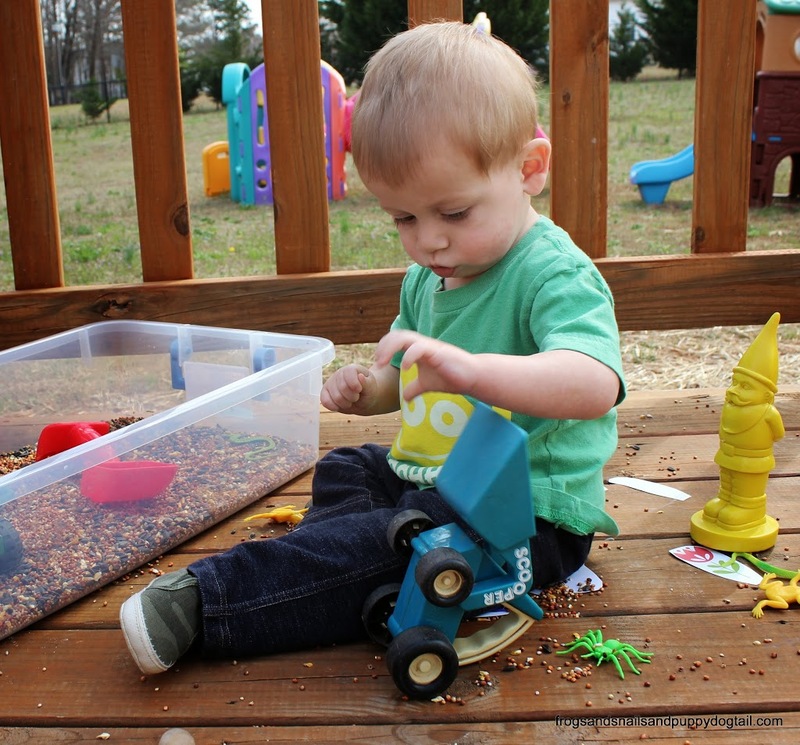 I can imagine he was thinking “oh, this is what all the fuss was about!” as he grabbed his first handful of seed. 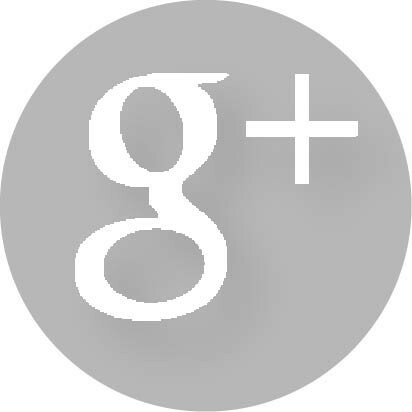 He sat quietly as he examined the tiny pieces in his palm. It was a priceless moment to watch his amazement and excitement during playtime. It did not take long before he climbed right inside the bin. I love that he lost a shoes and he even got to feel the seed with his foot because of it. All in and he could not get enough of this stuff. Scooping and pouring and pushing the trucks. Having 2 older brothers he is a pro at big boy play. 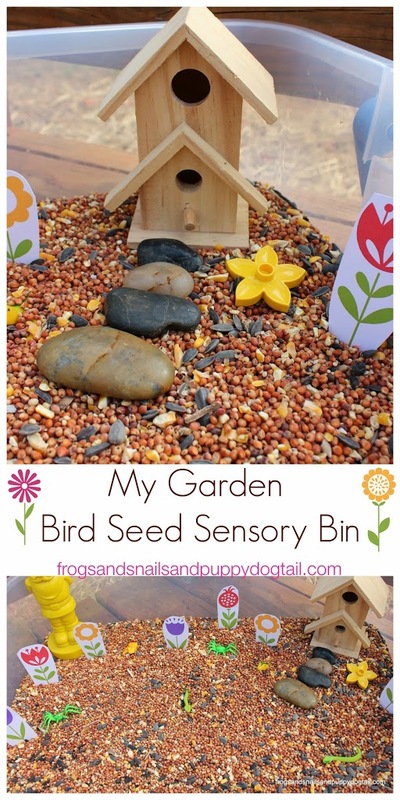 Would love to see your bird seed sensory binds too!! Link up below. I love all the extras you added! 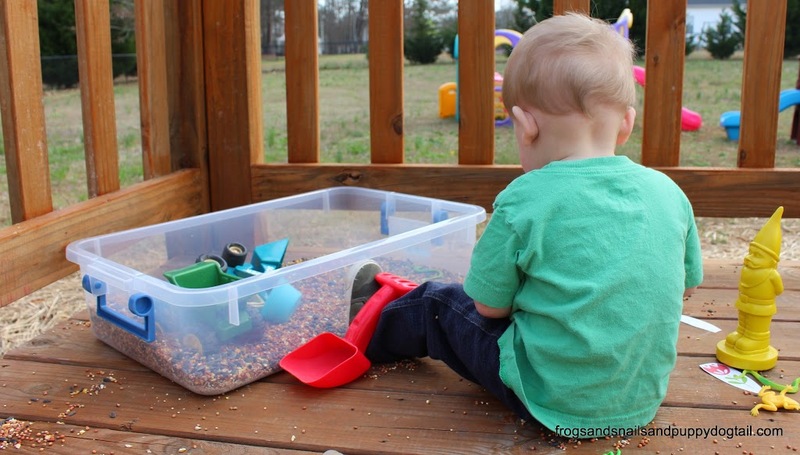 Bird seed is such a perfect filler, to me, because if you do it outside, the neighborhood birds are happy to do the cleanup for you! I’m definitely inspired! 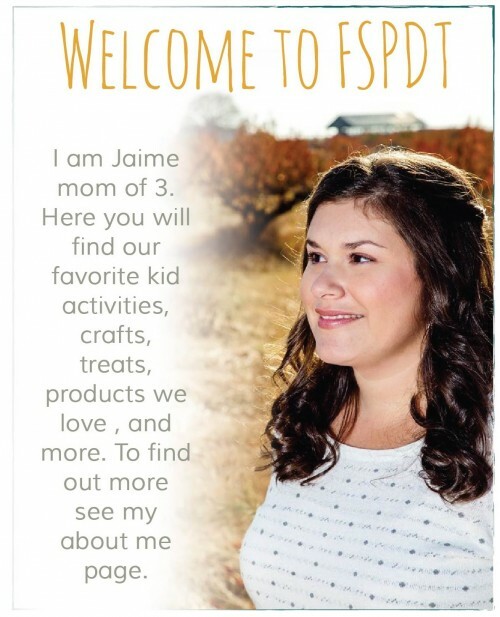 I’m going to be making one this week! I made one for my daughter, and she loves it! I credited you as my inspiration.